Ibrox Noise: Will JJ and Jimmy make big changes for Kilmarnock? Will JJ and Jimmy make big changes for Kilmarnock? In case it had been forgotten by everyone, and we’re pretty sure it had, we have a massive match of football on Saturday! Steve Clarke’s recently-stuttering Kilmarnock side come to Ibrox, finally struggling for the first time since the ex-Chelsea assistant took charge, and if there was a better time to face them, we would love to hear it. 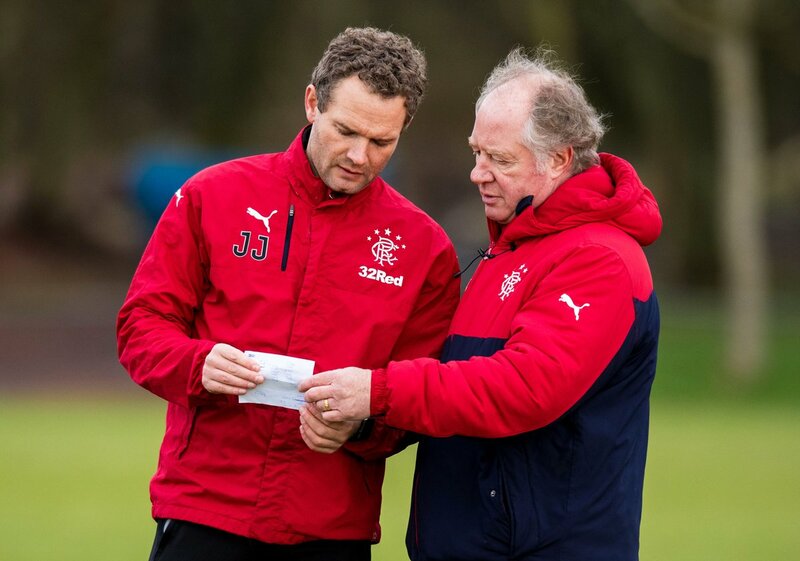 With Graeme Murty no longer in the Rangers picture, team selection and training is left to caretaker coaching pair Jimmy Nicholl and Jonatan Johansson, and usually when a manager leaves and a caretaker takes his place, fans expecting dramatic and wholesale changes are left disappointed as the temporary manager elects to keep things as they are. However, there are whispers Nicholl and Murty didn’t exactly get on like a house on fire, and their frequent lack of dialogue in the technical area certainly spoke volumes too. Pun not intended. Nicholl is a true Rangers man, and we do feel a sense of being a little safer in his hands than his predecessor, and over the next three matches it is absolutely critical he and JJ figure some way to ensure Rangers finish second. There is no denying there is a squad in there that is better than it has delivered in recent months. It has been dreadfully mismanaged and we clutch onto a lingering hope that most of that was down to Murty’s incompetence – Nicholl and JJ are both infinitely more experienced as coaches and both understand Rangers immensely. As for changes? Killie will be stuffy, and determined to regain form. So it has to be a Rangers team set up to invite Killie to break with tradition and come out more – to try and attack us, allowing us to pick them off with incisive flank play and sharper play through the middle. Use Sean Goss’s vision in partnership with Docherty’s graft and muscle, while Candeias and Murphy feed the strikers. We shall see what Jimmy and JJ concoct come Saturday. I think it is a simplification to lay the blame at Murty’s door. A number of these players have failed under consecutive managers, and in some cases like Tav - three managers. Good players take responsibility and make changes on the park if they see things going wrong. This Rangers team lack leadership and are serial losers. Candeias receiving Player of the Year was a disgrace after he downed tools in consecutive old firm games, and for me would never be anywhere a Rangers team again. I agree that it is/was not all Murty's fault. Things have happened behind closed doors that we may never hear of. But I feel that the team had stopped working for him, for whatever reason doesn't matter. Good players take responsibility and make changes? Yes, you hope so. But there are many good players who are not leaders. Rangers have no leaders on the pitch. People who can step up when things are going well, but not when times are hard. Maybe Alves, but hasn't been seen enough in bad times to know. Candeias not the only one who has downed tools - looked like they all had except Alnwick last week. So we would need 10 new players for the weekend. Can't be done. But I would expect to see at least 10 people told next month that they won't be playing next season at Ibrox. So get your agent to find you a move, or accept your football life is over. We won't be hard to deal with for most of the players, there are not that many we MUST keep. -We need a core of experience and leadership, which we lack. -Backup for both fullbacks. Youth team? -Forwards. Miller, Herrera out. Cummings, Hardie, McBurnie plus Morelos or a replacement. Windass and Morelos are worth money. Windass not strong enough for Celtic games, disappears so punt him. Personally, I would keep Morelos unless we get a big offer. He is young and will improve. He wants a big move, so will work to earn it. Have to agree with you both. The boy Barjonas hasn't had a fair go. That's the team I would send out apart for Martin he's fuking woeful but not much choice in that department. Was it no said John's out for the season with a broken hand??. If so I don't know for sure I would Keep it the same and stick Rossiter in at LB he's also left footed. Win Saturday then one more win should get us into the Europa. Im presuming Stevie Ger's will be in the stand, watch this these fukers they will turn into world beaters with him in the stand. In fact that's his pre match team talk Gerrards in the stand watching U all!!! There's the classic "he is a Rangers man" popping up again. There are millions of us who are Rangers men, doesn't mean we are any good at managing the team. That doesn't mean he will be any better. He will have even less respect from the players than Murty did because he was merely an assistant to the manager they wouldn't play for. I agree that Nicholl is a Rangers man and he will be hurting like we all are. I am sure he’d like to make wholesale changes to the team, but it is sometimes difficult to raise morale after the thrashing last Sunday and there will be players in the team unhappy that Murty hasn’t gone. Jimmy and JJ are under pressure to deliver 9 points from the three remaining games, a hard task. I have to disagree with your formation, this has been our biggest problem since the McCoist era. We have not been dominant in midfield for years now, we constantly complain about being bullied, so as we don’t have bruisers in midfield, make it hard for teams to break us down, so I have advocated for years, we need to play with 5 in midfield, ideally 3 5 2, but with a shambolic defence we need to play with a 4 5 1 formation, like many sides play against us, remember the Hamilton home game, one up front and two speedy midfielders playing on the break, Templeton one of them? So using your team selection, Cummings up front, Moreles dropping a bit deeper. The other problem, is we play too deep, we need to push the defence up at least 10 yards. With a closer packed defence and midfield this would help counter Jones Andy one of the other pacy wide men Kilmarnock have pushing us back and giving Boyd the chances he has often got this season. Could Wallace be brought back from club suspension? Not a bad team but I would have McRorie in for Goss. I also would like to see Lee Wallace back as he is far superior to John. The caretakers are limited in choices but for me Halliday, Dorrans & Holt must drop out the squad. Nowhere near goodbye enough and never will be. If they do that and make the midfield strong we will be ok.
Not meaning to offend anyone, but I will play for the gers for nothing in place of Martin, but I am registered blind and wear a leg brace with a club foot ( honestly) oh and I am 61 years old , but at least I will give 150% effort for my team , but will agree the rest of the side looks good . Just don't play McCrorie or Martin as centre halves! I'd like to see Middleton in the starting line up instead of Murphy, if your good enough your old enough!